SD33: Doug Mastriano Joins GOP Race: The retired Army colonel likens himself to Trump for being political outsiders. Marino Cites Health Issues For Resignation: Marino said the timing of his resignation was intended to hold the special election the same day as the primary election, in an effort to not cost taxpayers any money. Kenney Announces Re-Election Bid for Philly Mayor: The incumbent makes school funding the central theme of his announcement video. Former state Rep. Adam Harris hired by Brewers of Pennsylvania: The former Republican state representative and former Chair of Pennsylvania’s House Liquor Control Committee joined the group as the new Deputy Director. Costello Thinks These 2020 Dem Contenders Will Resonate in his old district: In a McClatchy story titled “These are the Democrats winning the ‘Never Trump’ Republican primary,” former Rep. Ryan Costello (R-Chester) was quoted saying he believes former Vice President Joe Biden, Sen. Amy Klobuchar (D-MN), and former New York City Mayor Michael Bloomberg would resonate most with his former constituents. This was not an endorsement, just political analysis of the district. 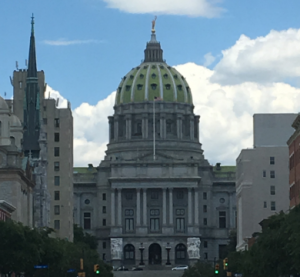 Pennsylvania Capital-Star: Could this be the year Pennsylvania lawmakers ban LGBTQ discrimination? Pennsylvania Capital-Star: Bipartisanship is passé. No one told Jordan Harris. Inquirer: On guns, California wants to be a model for states. Should that matter to Pennsylvania? Inquirer: Sidewalk blocked by construction? Philly offers new accountability on street obstructions. York Daily Record: Pa. Fact Finder: Did 0 cases get thrown out because of speedy-trial issues in York County? Inquirer Editorial Board: Is City Council addicted to Big Pharma?